In a big month for numbers on the Chinese economy, the picture is already looking decidedly mixed. October is a big month for Chinese economic data. Not only do we get the monthly figures as usual, but third quarter (3Q) results are also released. We still haven’t got all of these figures, but already the picture is looking complicated for policymakers in Beijing. The myth of China as an export driven economy has largely been undermined (although not entirely it seems) by data proving that the country is in fact more driven by investment than the demand of foreign markets. However, China does depend on exports for a significant amount of employment, and employment is a key factor for the Communist Party as it seeks to maintain popularity. Hence the trade data for China in September was somewhat surprising. Exports actually fell by 0.3 percent year-on-year (YonY). Imports meanwhile, performed better than expected with a rise of 7.4 percent YonY. Although this still left China with a hefty growth boosting USD$15billion monthly trade surplus, there may be some explaining to do. Did fear about the Fed’s taper dampening sentiment globally, negatively affecting demand for Chinese exports? It indeed appears from the data that demand in the EU, the U.S., South Korea, Taiwan and Australia was low for Chinese goods. Or could this be due to this year’s ongoing rise in the value of the RMB? To answer these questions and more, the data through the rest of the year is going to be watched very closely by those seeking to predict what Beijing is going to do, and therefore how markets will fare. September’s inflation data, released on Monday, provided another complication for those trying to get a clear picture of what is going on. Producer Price inflation remained negative and fell 1.3% YonY, highlighting China’s ongoing problems with overcapacity. Meanwhile, consumer price inflation (measured by the CPI) unexpectedly rose to a seven month high of 3.1%. Whilst not disastrous in itself, this figure complicates monetary policy, because the real benchmark deposit rate is now negative again. Equally, food prices seem to be behind much of the increase. This is never a good thing as food price rises tend to hit poor people (for whom food purchases make up a larger portion of spending) much worse. Then we come to China’s credit data, important for its relationship to runaway investment levels, a real estate market that is frothy in some areas, and the all important question of debt levels. Chinese banks made a larger than expected RMB 787 billion of loans in September, whilst “total social financing” (which includes several other, but not all, forms of credit creation) fell from August’s total to RMB1.4trillion. The People’s Bank of China, considered very much to be a pro-reform institution, has already sounded the alarm about this increase in credit. However, the PBOC’s job is being complicated, as usual, by its mandated need to manage foreign exchange inflows in order to maintain the RMB’s ongoing peg to the USD. China’s foreign exchange reserves increased by USD160billion in the 3Q, suggesting that the money supply in China must have received quite a boost once again during these operations. 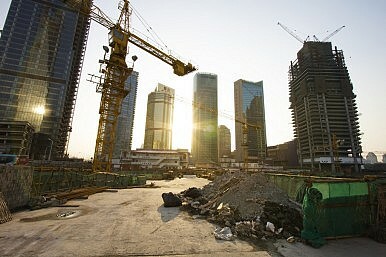 China’s fine line is getting trickier and trickier to walk, and all eyes will be on this coming Friday’s data release – we are to be treated to 3Q GDP, Fixed Asset Investment, Industrial Production and Retail Sales – as market participants try to double guess what Beijing will do through the end of this year and into next. As a final note, readers who may be watching a steady uptick in rhetoric and threats from Beijing on the subject of the goings on in Washington D.C. with regard to U.S. government debt (for example here) may like to look back at Pacific Money’s post from September 2012 (you can find it here).